IN THE U.S. AND CANADA . . .
Come be part of a real citizen-science project. Only one spot left for November! We started out this week at Hilton Pond Center wanting to document and photograph a few flowering plants growing locally during the first half of July. Despite our best intentions, we were thwarted by unusually breezy mornings, excessively hot and sunny afternoons, and evening thunderstorms--conditions not very conducive to taking close-up photos of flora either native or non-native. We did get out one still morning with camera, macro lens, and tripod to capture a three-inch-wide purplish blossom growing on a long thin vine close to the ground. 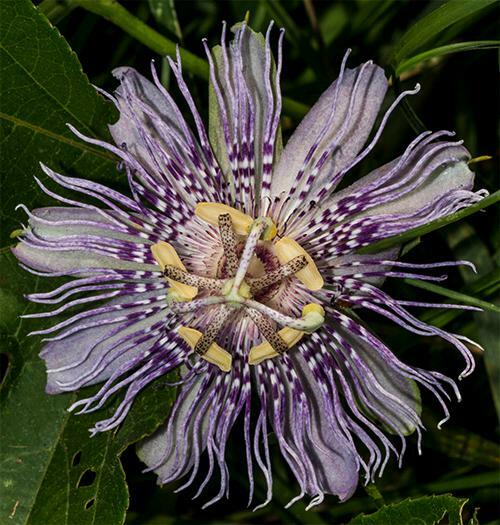 This was without any doubt Purple Passionflower, Passiflora incarnata (above), one of the most intricate native flowers to be found at the Center. 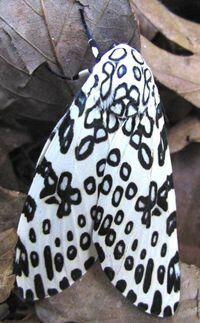 Five flattened pale whitish-green sepals comprise the outermost part, alternating with five whitish-purple petals; collectively, these similarly-shaped structures are sometimes called "tepals." Further in is the corona, a fringe of purple and white filaments. At the center are five stamens that arch down and end in oval, pale-yellow anthers that bear pollen. The female part of the flower--the pistil--splits into three pollen-receiving stigmata that also curl downward. A foraging Bumblebee trying to reach fragrant nectar at the base of the pistil cannot help but pick up pollen she transfers to the next Purple Passionflower she visits. After we photographed the passionflower, the wind picked up and it started to drizzle, so we retreated to the old farmhouse at Hilton Pond Center. We much prefer to photograph nature subjects in situ and under natural light, but without cooperating weather conditions we were forced to move our efforts efforts indoors to the bird banding table where we set up a desktop tripod and camera with macro lens. We then brought in several species growing abundantly around the Center and began our rainy day picture-taking against a black velvet cloth. This wasn't exactly a natural habitat, but it did allow us to focus on each flower without any background distractions. First up (above) was a three-inch specimen that obviously was a member of the Sunflower Family (Compositae or Asteraceae). Composite flowers typically have a ring of sterile ray flowers surrounding a central cluster of fertile, seed-producing disk flowers. In the blossom above those showy ray flowers--which attract the attention of pollinators and direct them toward the nectar and pollen borne by disk flowers--are pale yellow. There are LOTS of yellow sunflowers in the world, some of which are difficult to identify without looking at root, stem, leaf, flower, and seed (to say nothing of size, growth pattern, habitat, bloom season, and geographic distribution)--hence the the botanist's habit of referring to them collectively as DYCs, or "damned yellow composites." However, like CFWs ("confusing fall warblers") that are the bane of bird watchers, DYCs eventually can be identified with some effort and minimal cursing, so we set about trying to determine just which composite was in our camera's eye. After consulting field guides, plant keys, and Google (DYC indeed!) 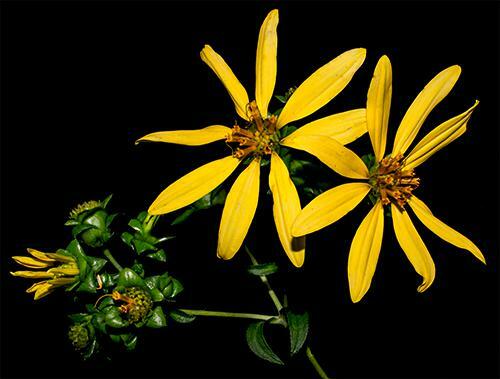 we finally concluded our composite was Woodland Sunflower, Helianthus divaricatus, a rough-stemmed native that blooms mid-summer through fall in sunny spots such as roadsides. Pollination is by Bumblebees and other long-tongued and short-tongued bees, plus various flies, wasps, and butterflies. Woodland Sunflower is also a host plant for larvae of Silvery Checkerspot and Painted Lady butterflies, among others. Although it looks nothing like Woodland Sunflower, the Bull Thistle, Cirsium vulgare (above), is also in the Composite Family. This invasive non-native has prickly stems and leaves that deter browsers so efficiently old fields and meadows can be overtaken in just a few years. 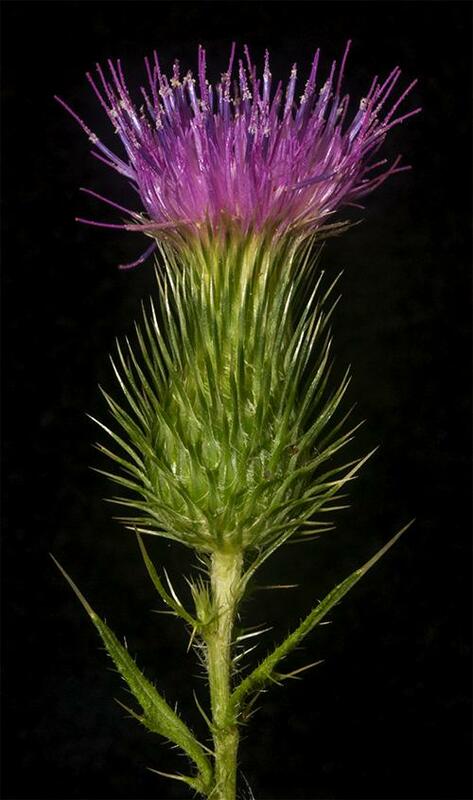 (IDENTIFICATION HINT: Our several native thistle species have stems that lack spines.) Bull Thistle is a true biennial, existing as a rosette in its first year after germination and flowering in its second year before dying. Although a composite, the flowerhead contains no ray flowers--only pinkish-purple disk flowers. Pollination is mostly by long-tongued bees, although many native insects visit Bull Thistle and steal its copious nectar without pollen transfer. Each Bull Thistle flower head produces a cluster of dozens of naked seeds. Fine hairs surrounding each achene catch the wind and easily help the mother plant spread her genes over considerable distances. 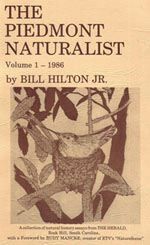 (We find it interesting this species has appeared at Hilton Pond Center only in the past few years--undoubtedly disseminated via wind from a neighboring farmer's pasture.) 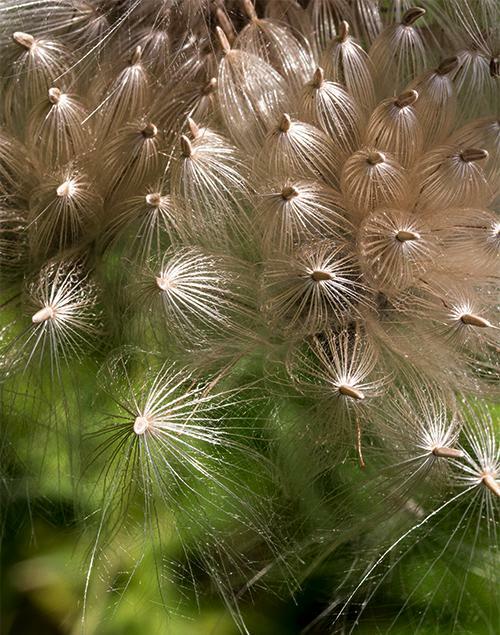 The photo above--taken outdoors this week during a rare windless, cloud-free day--depicts seed hairs glistening in the sun. American Goldfinches collect this thistle down to line their late summer nests and soon after gather nutritious thistle seeds to feed their chicks. Tiny quarter-inch white flowers of Pokeweed, Phytolacca americana (above), grow on horizontal racemes; after being pollinated by syrphids (AKA Hoverflies or Flower Flies), they become those familiar blue-black berries that hang vertically from the plant. In the photo above, fertilized green ovaries are already beginning to swell and enlarge. Pokeweed flowers have what appear to be petals but are actually sepals--modified outer leaves that protect the reproductive parts before the flower itself opens. Although all parts of the Pokeweed plant are poisonous to mammals, birds relish the succulent fruits and eat them with impunity. Many times our hands and clothing have been stained purple when a bird-in-the-hand explosively voided its Pokeberry lunch in our direction. Pokeweed is the host plant for Giant Leopard Moths (above right), whose larvae are Giant Woolly Bear caterpillars. Horse-nettle, Solanum carolinense (above)--with its very-pale-purple ghost-like petals--is another native plant poisonous to humans. 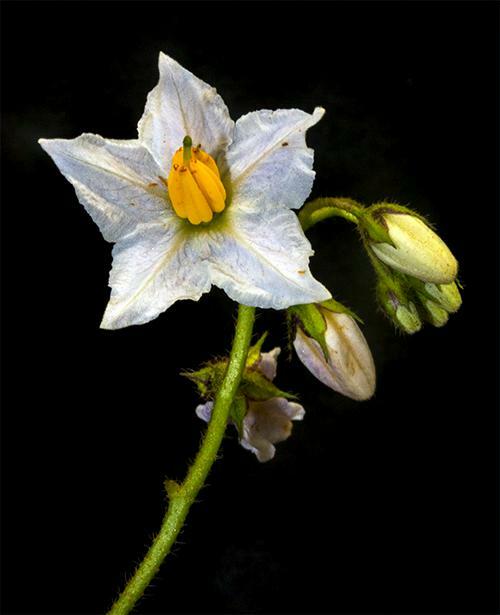 A member of the Nightshade Family (Solanaceae), all its parts contain the toxic alkaloid solanine, which if ingested can cause respiratory failure and death. Again, birds eat its yellow tomato-like fruit without difficulty; the plant itself is seldom browsed because of tiny spines along the stems and on the under-surface of mature leaves. It grows only along roadsides at Hilton Pond Center. Horse-nettle's principal pollinators are Bumblebees that visit its flowers not for nectar but for pollen they shake loose from plump yellow stamens by rapidly vibrating their thoracic muscles; this is known as "buzz pollination." If ever there were a plant that resembles a serpent-headed Medusa it is Small-leaved Sensitive Brier, Mimosa (formerly Schrankia) microphylla (above). Although its tangle of elongated pistils and yellow-tipped stamens do not slither around like snakes, when you touch this plant's leaves they quickly respond by folding up--hence the nickname "sensitive plant." Also known as Cat-brier because of its recurved, claw-like spines, this plant grows as a ground-hugging vine in dry, sunny places at Hilton Pond Center. 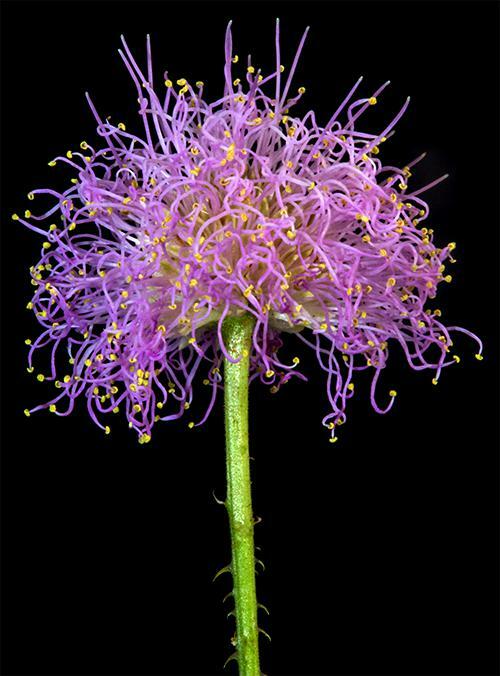 Although in close-up view the flower head is a rough jumble of filaments, from a distance it looks more like a pink powderpuff. A member of the Pea Family (Fabaceae), Cat-brier is apparently pollinated by tiny flies whose work results in little pea pods. Floating Primrose-willow, Ludwigia peploides glabrescens (above), is a prolific native that appears in the shallows when waters of Hilton Pond evaporate in summer heat. This is an emergent species whose weak roots penetrate the muddy pond bottom as the plant sends out a rambling network of stolons (runners). In drought years, Ludwigia nearly takes over the mudflats of our weather-reduced impoundment, but winter rains re-fill the pond and seem to drown the vegetative snarl. Although many kinds of small bees visit Primrose-willow's five-petaled yellow flowers in search of nectar, apparently not all are effective pollinators. This aquatic species was introduced to Europe, where some countries find it so invasive it has been banned from import. 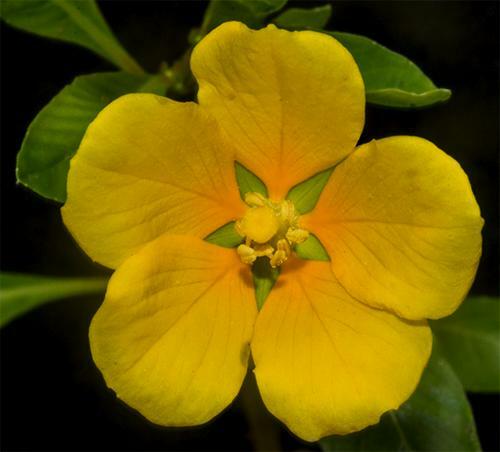 Likewise, in parts of the U.S. some Ludwigia species are considered to be noxious weeds because they increase sedimentation and choke out aquatic plants that are more wildlife-friendly. 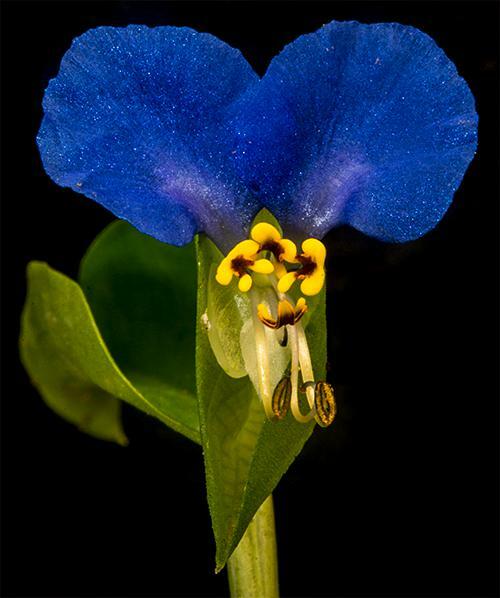 Asiatic Dayflower, Commelina communis (above), is a delicate non-native annual with unusual configuration. First, there are two erect "true blue" petals, with a smaller inconspicuous white one pointing down. What looks like four tiny yellow flowers are actually showy, sterile male flowers (anthers); these are above two lower pollen-bearing stamens that point down and curve up. And a single up-turned female pistil is almost hidden behind the two stamens. As implied, each dayflower soon wilts in the heat of the sun, lasting only a few hours. This prolific herbaceous species re-seeds easily and can grow in near-monoculture in moist, partly shaded locales--particularly those that have been disturbed. 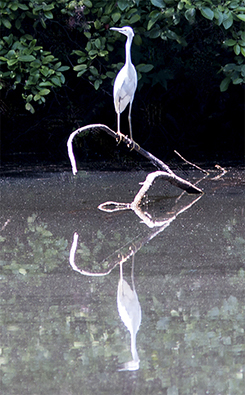 (Its favorite spots at the Center are down near the pond where there's more morning dew.) Fortunately, Asiatic Dayflower is a favorite browse of equally abundant White-tailed Deer that help keep it in check in many locations. As a non-native, it doesn't appear to be a host plant for any native insects, but it is pollinated by small native bees. 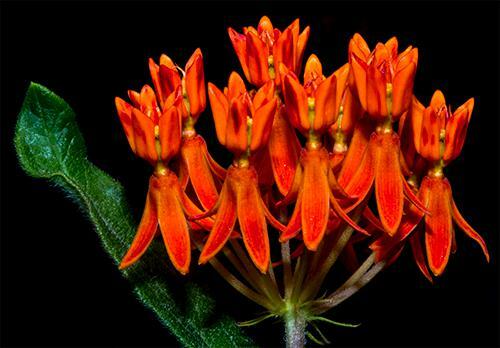 These days, some of the most popular species among native plant enthusiasts are milkweeds, not only because they have eye-pleasing flowers but because they are obligate host plants for Monarch butterflies. Under siege by habitat loss and rampant insecticide use, Monarchs could use everyone's assistance in the form of planted milkweed plots. Here at Hilton Pond Center we've had no success cultivating the common Purple Milkweed, but Swamp Milkweed, Asclepias incarnata (above), arrived on its own about 15 years ago and grows in several moist spots around the pond itself. We've always been fascinated by milkweed inflorescence, with individual flowers being "mirror images" of themselves; i.e., there are five petals folding down, while five "hoods" fold up. (Five small green sepals are hidden by the petals.) Adult Monarchs and other butterflies visit our dark pink and white Swamp Milkweed blossoms, as do various bees that help pollinate. Thus attracted, a Monarch female lays her eggs on milkweed foliage; after hatching the voracious larvae make short work of the leaves. Although all milkweeds don't produce milky-white sap, this one does; poisonous alkaloids in the sap make Monarch caterpillars and butterflies unpalatable to potential predators. One of the most familiar early summer field flowers around Hilton Pond Center is Queen Anne's Lace, Daucus carota (above), a non-native undoubtedly brought to the New World by the earliest European settlers. It is now nearly ubiquitous in early old field succession or along roadsides, and even in sunny front lawns where homeowners don't feel obligated to mow on a weekly basis. Also known as Wild Carrot, this biennial species does have a tasty white carrot-like root that can be eaten raw. 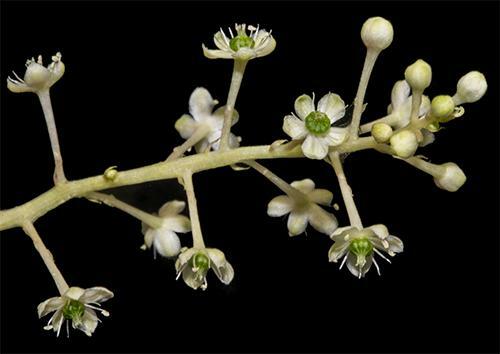 Flowers are produced atop long bare stalks in an umbel configuration (think "umbrella"). 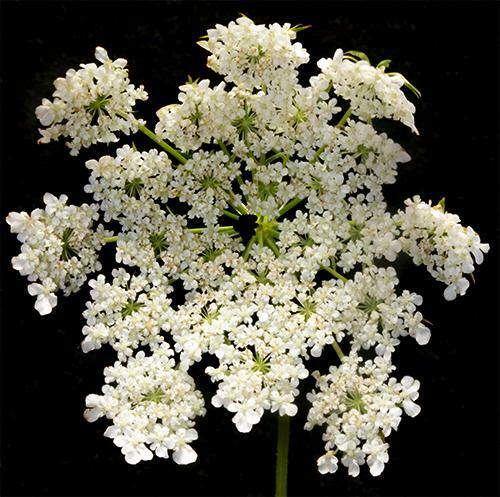 In a big mature flower head, each compound umbel contains 20-90 umbellets, each in turn with 15-60 flowers. A big Queen Anne's Lace flower head can be more than four inches across, with thousands of individual florets. It's no wonder this foreign invader is so prolific! Most of its reproductive success, of course, comes because pollinators are attracted to its prominent inflorescence; often we have seen multiple bees, flies, wasps, beetles, and other insects on one flowerhead--to say nothing of the predatory spiders that sometimes lie camouflaged within the umbel. With all those insects coming and going in pursuit of nectar and pollen, the flower head also serves as a stable platform for mating. 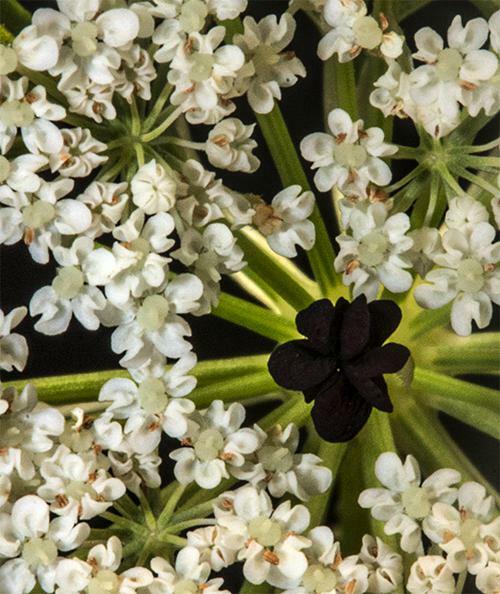 One big mystery surrounding Queen Anne's Lace is the presence--among all those white flowers--of a single purplish-black floret at umbel-center (see above). The dark floret (above) is indeed mysterious, especially since it doesn't occur on every umbel and because occasional umbels have multiple dark florets. Some botanists have speculated this decidedly different floret is a target that brings potential pollinators to the middle of the flower, whence non-flying insects would have to navigate an optimal number of florets to get to the perimeter. Likewise, folks have hypothesized the dark floret mimics a small dark insect that, in turn, attracts more small dark insects interested in food--or in mating. 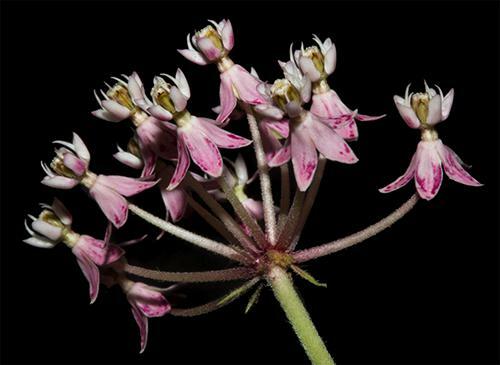 Other researchers (Polte & Reinhold 2012) found the dark floret had nothing to do with pollination but that umbels bearing a dark central floret "were parasitized significantly less often by the gall midge Kiefferia pericarpiicola than umbels without. . . . The dark central floret may play a role in reducing parasite infestation by mimicking an already present gall or deterring oviposition of the gall midge by other means." 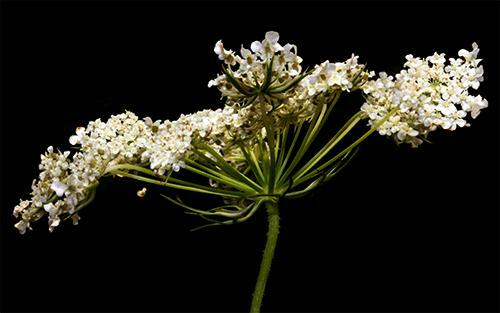 Who knew Queen Anne's Lace could be so mysterious, or so controversial? As we looked for early July wildflowers at Hilton Pond Center, our eyes were drawn to an inconspicuous plant with a one-inch purple flower that grows in various local habitats. 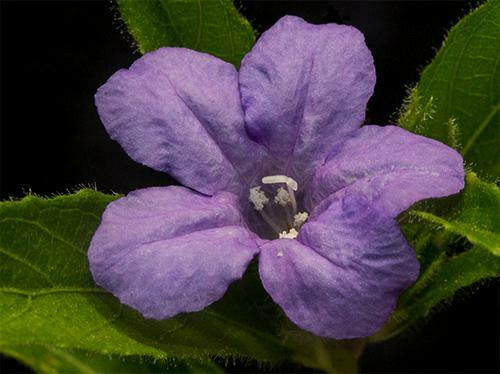 Carolina Wild Petunia, Ruellia caroliniensis (above), first appeared on our property about a dozen years ago. Since then, this southeastern native has spread and we're able to find it spring through autumn, primarily in shady spots near the old farmhouse. The flower's five violet-colored petals--fused to form a trumpet--contrast with slightly fuzzy, dark green leaves beneath. Pollination is by small bees; the plant also serves as a host plant for larvae of Common Buckeye butterflies. We would be remiss in a photo essay about early July flora at Hilton Pond Center if we did not mention the robust blossoms of Trumpet Creeper, Campsis radicans (above). After all, with the Ruby-throated Hummingbird being our primary study species here and in the Neotropics, it's reasonable we should also be interested in a plant we consider to be the single most important native hummingbird plant in the eastern U.S. Trumpet Creeper's big 4-inch-long flowers offer a huge nectar load and because of their bright orange coloration are easily spotted by hummingbirds against a sea of green foliage. Ruby-throats are undoubtedly the plant's main pollinators; the forehead of a hummer is in just the right place to pick up pollen from one flower's stamens (along the top rim of the tube) and deposit it on the pistil (in the same location) on the next flower. We think it's not coincidental that Trumpet Creeper starts flowering at the Center in mid-May (when the first ruby-throat chicks are hatching) and continues until early September (when most ruby-throats start to head south). 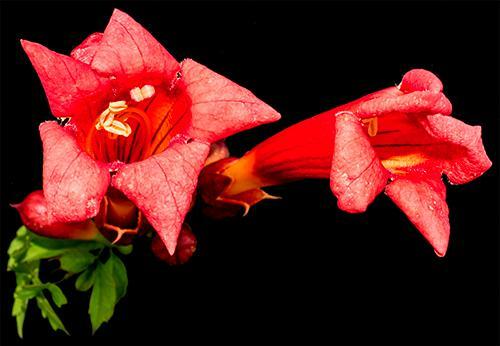 Another interesting thing about Trumpet Creeper flowers is revealed in the photo above; each one has a series of "bee guides," dark lines that point deep into the flower where the nectar lines. Although the blossoms are indeed visited by Carpenter Bees and Bumblebees, in this case we think the directional lines should be called "hummer guides." Folks usually think of spring as the best time to find flowering plants; if you're deep in the hardwood forest that may be the case. Nonetheless, despite hot breezes and cool thunderstorms of early July there are plants a-bloomin' if one knows where to look. 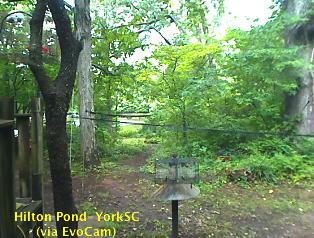 At Hilton Pond Center that's often along roadsides or in open meadows where the summer sun shines brightly . . . most of the time. If you like shopping on-line please become a member of iGive, through which 2,000+ on-line stores from Amazon to Lands' End and even iTunes donate a percentage of your purchase price to support Hilton Pond Center. Every new member who registers with iGive and makes a purchase through them earns an ADDITIONAL $5 for the Center. You can even do Web searches through iGive and earn a penny per search--sometimes TWO--for the cause! Please enroll by going to the iGive Web site. It's a painless, important way for YOU to support our on-going work in conservation, education, and research. Add the iGive Toolbar to your browser and register Operation RubyThroat as your preferred charity to make it even easier to help Hilton Pond Center when you shop. --Hilton Pond Center's Web site went down late on 1 Jul and was off-line until the afternoon of 5 Jul. Sadly, our usually dependable service provider was unable to correct the problem during the Fourth of July weekend. Even worse, our Operation RubyThroat site (rubythroat.org) was also down. We regret any inconvenience you may have experienced. --Because of intense heat, high humidity, and frequent thunderstorms during the first half of Jul 2016 we haven't even tried to run mist nets at the Center, choosing instead to deploy a half dozen hummingbird traps and a couple of other traps baited with black sunflower seed. As might be expected, about all we've been catching is Ruby-throated Hummingbirds & House Finches--two species that are all around us this summer. --Despite a slow start in 2016 Ruby-throated Hummingbirds are indeed increasing in number around Hilton Pond. In fact, 54 RTHU banded through 15 Jul make that the third earliest date we've reached that number; the only faster years were 2014 (58 banded through the 15th) and last year (64 banded). Curiously, only 15 of this year's new captures have been adults (6 male, 9 female)--very unusual for the Center. As of mid-month we've also recaptured 33 adult RTHU banded in previous years--already above our full-season 32-year average of just 25. An adult female recaptured on 8 Jul was banded in 2015 as a recent fledgling; her distended cloaca indicates she's still laying eggs--likely her second clutch of the season. --The immediate past installment of "This Week at Hilton Pond" was a collection of diurnal and nocturnal images captured by one of our trail cams at the Center, complete with anecdotal text. It is archived and always available on our Web site as Installment #641. We're very pleased this photo essay has been viewed more than 1,500 times.